Many congratulations to the 2016-17 course which graduated at a special service and ceremony in Airdrie on Saturday 24th March. 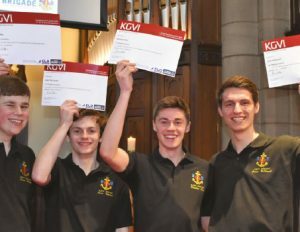 The KGVI cadets received their certificates from Superintendent Gavin Russell from Police Scotland, who is a former member of the 2nd Airdrie company. The 2018 New Entrants’ course takes place at Carronvale House, our national training centre in Larbert, Stirlingshire, from 14th – 20th July.